Posture devices as seen above usually induce people to switch from one bad posture (slumping) to another (arching). Most people believe they need to "sit up straight." In fact, arched posture can do as much harm as slumping does. Hands-on training by a Gokhale Method teacher can teach you truly healthy posture; following that, a reminder system, whether like the one above or a simple alarm that goes off periodically, will induce you to reset yourself in a healthy way. 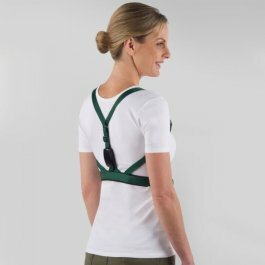 There’s no magic cushion, or brace, or buzzing device that will give someone perfect posture without hands-on coaching. But over the years, our students' input and feedback taught us to see that there is significant value to be had from certain types of posture aids. We still teach the use of a towel as a great stretchsitting device, but before we developed the Stretchsit Cushion, we frequently received feedback about how people found it difficult—or impossible—to use a towel on their wooden chair, their plastic outdoor furniture, or their slippery office chair. 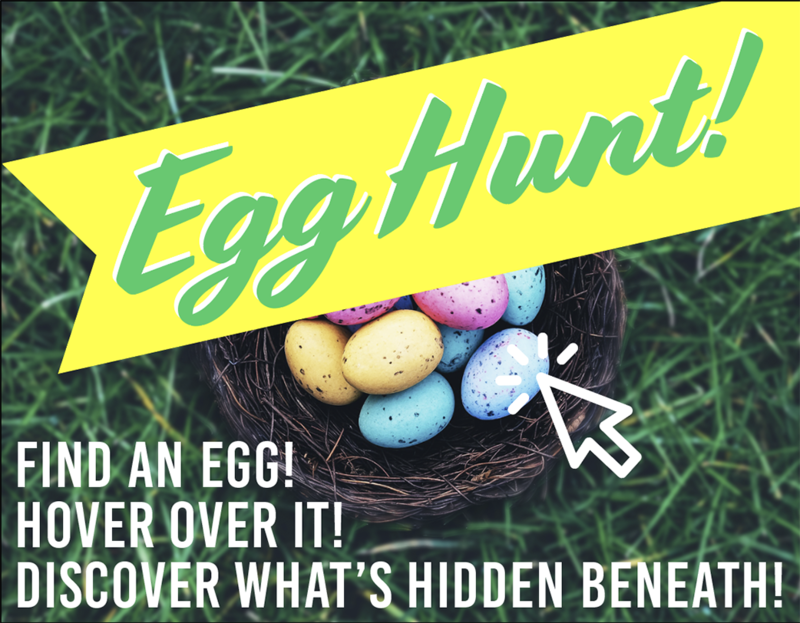 They hated trying to use rubber bands and bungee cords and clothes pegs, and having to refold or readjust the towel to be the right size. The towel method works for some seats, but many students found it frustrating to set up or adjust. We kept hearing, “Can’t you just make something I can throw on a chair easily?” So we listened. 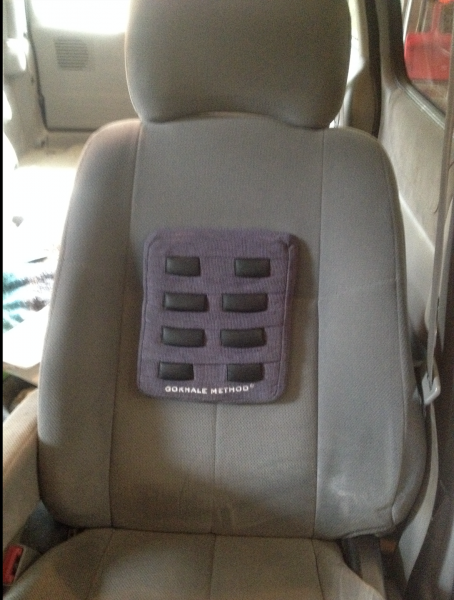 Having the Stretchsit Cushion in your car means you spend significantly less time setting up and adjusting your cushions, and it can't slip out of place! Developing and manufacturing a product was new for me and for the company, so it took a few tries to get to where we are today. I learned a lot about persistence. Our first round of the Stretchsit Cushion, V1, had oval rubber nubs. Pro: very sticky! Con: the stitches tore through the rubber from the shear forces of stretchsitting—people stuck too well! It’s better that the compression forces went to the nubs rather than the discs in people’s back, but our customers were naturally disappointed when their cushions failed. This was V1 of the Stretchsit Cushion. Instead of endlessly replacing products, we moved on to a tougher, textured nub that is stuffed with foam to be more durable. 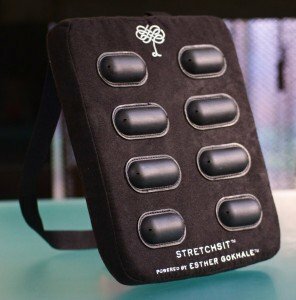 The Stretchsit cushion's nubs are now made from a strong, textured material that will provide friction without ripping. A lot of nubs to help a lot of spinal discs! 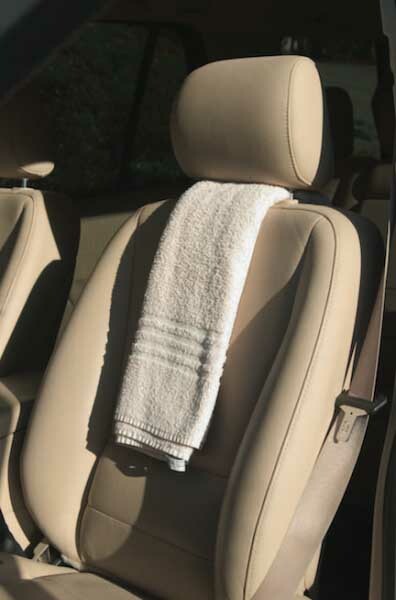 Additionally we switched to stronger, more color-fast fabric so cushions in cars or sunlit rooms don't get sun-bleached. We also used a more durable foam for the body of the cushion - one that is malleable enough to accommodate many spine shapes, but strong enough to stand up to wear and tear over time without deteriorating. The front panel of the cushion created by a seamstress using a sewing machine. It took us several rounds of production to get to the great cushion we have today. 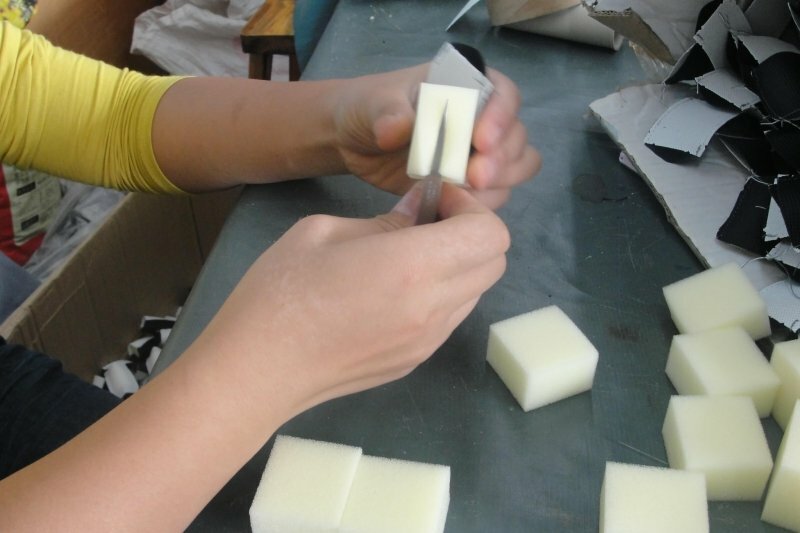 We were determined to not compromise on the quality of the materials or the function of the product. When we first started designing the cushion, we didn’t know all the factors we would have to take into account to reach a really high standard. Now we are proud that our cushion receives very few complaints and an awful lot of praise! The Stretchsit cushion is available from a teacher near you, our website, or Amazon. Q: Where can I purchase a Stretchsit Cushion? A: If you are taking a Gokhale Method class, we recommend purchasing one directly from your teacher. Otherwise, you can buy them from our website or from Amazon.com. You can save on bundles of 2 or 3 cushions, available only through our website. Q: Why is there such firm / soft foam in the cushion? 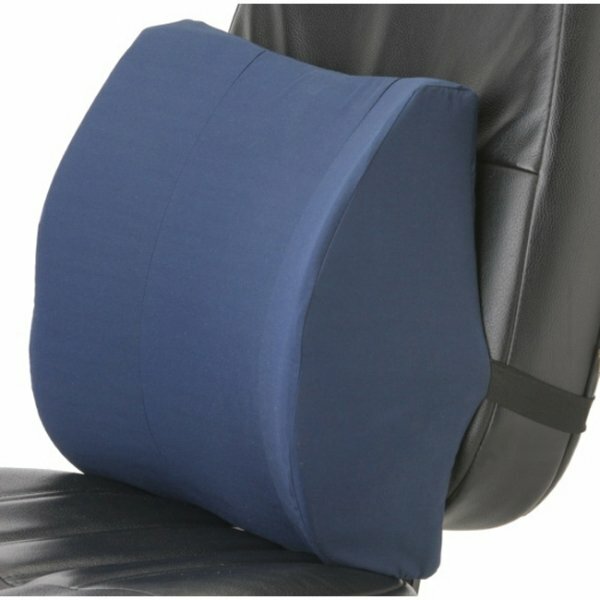 Wouldn’t a softer / harder cushion be more comfortable? A: There are research studies showing that medium-firm mattresses provide people with the most comfort and support. We’ve discovered this to be true for our stretchsit cushion as well. On one hand, we wanted it to be supportive; on the other, we wanted it to be comfortable and conform to a variety of body shapes. We played with the hardness of the foam and of the nubs, and after many iterations have come to a harmonious place, similar to a medium-firm mattress. Each nub is stuffed with foam of an appropriate density so it will protrude from the cushion without being uncomfortable against the back. Q: Why isn’t the Stretchsit Cushion cheaper, when I can find $25 foam cushions at stores like Bed Bath & Beyond? A: We find our Stretchsit Cushion is actually less expensive than high-end lumbar supports or memory foam pads, but yes, there are cheaper foam cushions on the market. Many of these cheap options deteriorate quickly, and aren’t dense enough to provide significant support (although they will soften a hard or rough surface, if that is all that is desired). In the Gokhale Method philosophy, lumbar supports do not solve, and may exacerbate, the problem of compression by causing a sway in the lumbar spine (lumbar supports are designed to encourage the S-shaped spinal ideal that we teach away from). 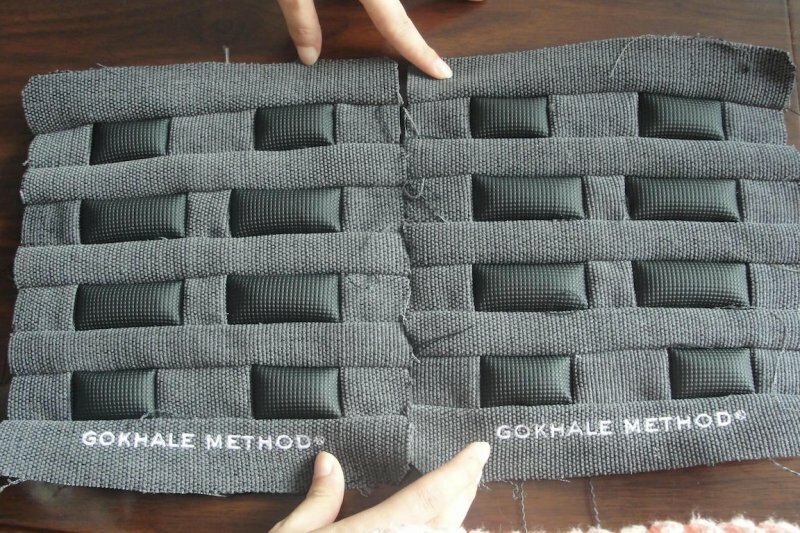 What’s needed is a thoracic support that offers friction, which isn't possible with a simplistic single block of molded foam and a fabric cover. 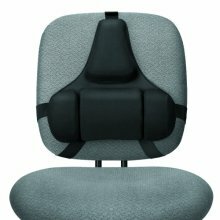 A typical lumbar support cushion may exacerbate a sway and doesn't support a J-spine. To provide function and comfort at the standard we hold ourselves to requires a higher level of sophistication, which we’re very happy to have reached in the Stretchsit Cushion. 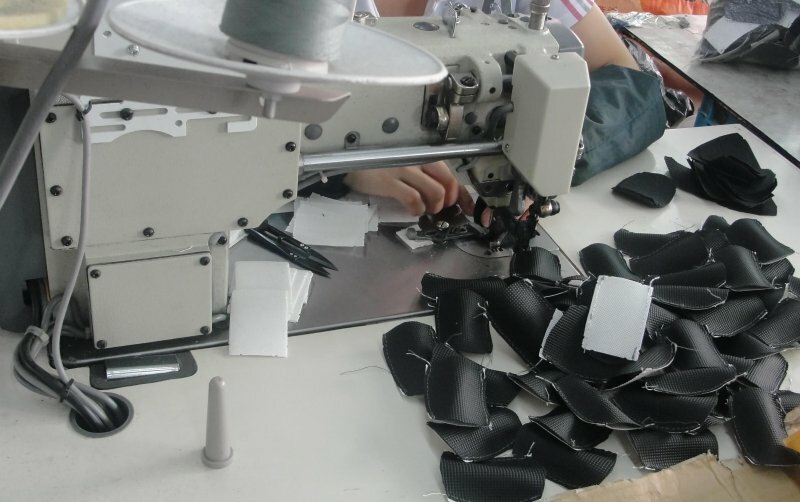 The production process for our cushion is rather intricate, and to make small high-friction nubs of appropriately strong material requires the individual nubs to be worked by someone using a sewing machine rather than industrial sewing. 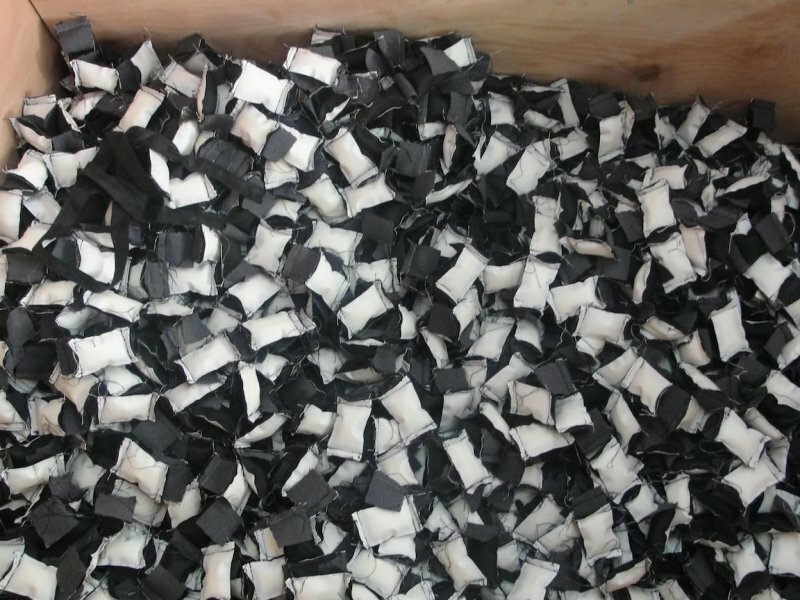 This, and the quality of our materials, is what dictates the price of our cushion. We receive numerous reports on how much benefit people get out of their cushions, so we consider that although it can seem expensive at first, when the cushion is considered as an investment in the health of your spinal discs, nerves, and vertebrae, it is really a steal! Q: Should I buy your cushion and use it with my current chair or buy the Gokhale Pain Free Chair? A: You will need the cushion for your carseat and in chairs that you have no control of. We sell a bundle of three cushions because people frequently want one for the car, one for their work chair, and one for their computer chair at home. 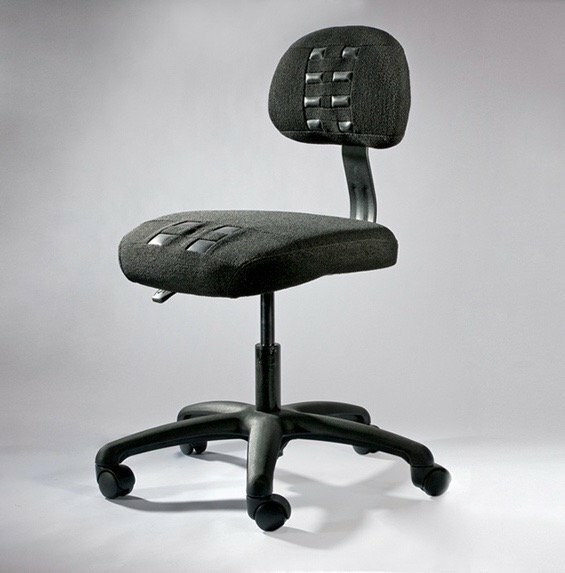 If you are in the market for a chair, the Gokhale Pain Free chair is a marvelous investment. It has a 10 year warranty on parts (here too we did not skimp on quality or function), and will support you in stretchsitting (it has a built-in stretchsit cushion) as well as in stacksitting (it has a built-in wedge). It has other helpful features like a “mushroom top” seat to facilitate external rotation of the legs, and no armrests so you can come in close to your work surface (if your shoulders are properly rolled open, you will not miss the arm rests). No other chair has these features. 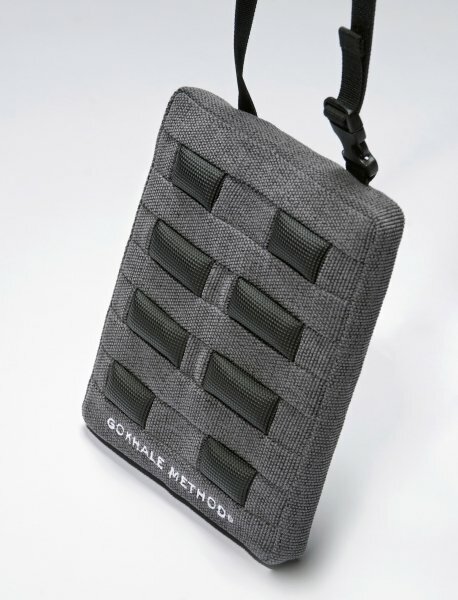 The Gokhale Method Pain-Free Chair has a built-in Stretchsit Cushion and a built-in wedge with additional nubs in the seat for greater traction. That said, if you are financially pressed, we recommend economizing by buying the Stretchsit Cushion and using a folded blanket for stacksitting. These inexpensive additions to your chair allow you to achieve healthy posture; the drawback is that it won’t look as elegant and you will need to adjust your implements periodically. Previous Post: How to Fix Muscle Imbalances - Do They Matter? For years my running joke was - In the morning (or after a long car trip) I was the evolution-of-man-poster guy, i.e. it took me 5 or 6 steps after getting out of bed (or exiting the car) to become fully erect. Almost 2 years ago a friend heard Esther on NPR and suggested I look into it. Now I can't use my joke any more. But... I'm also not in pain any more. I'll take the no-pain option. I swear by these Stretchsit cushions. So much so, that I own four of them (and probably should order a couple more). In fact, I actually sewed one in to my car seat. Zero hassles. Thank you so much Esther. I tell everyone I know about you and your method. Wow!! How in the world did you get this to work? Needle and thread all around the perimeter ? A few select spots tacked onto the carseat? Are you not concerned that the carseat fabrick will rent after a while? Might it not be a good idea to use the extension strap(s) hung around the headrest to take at least some of the forces away from the carseat fabric? At any rate, congrats on our inventiveness! And I'm very happy you switched out the joke for a pain-free back! That's a great trade. Please post your review on our Stretchsit page on Amazon (the cushion was only made available on Amazon a few months ago so we have a small number of ratings / reviews). I did wonder how the car seat material would hold up. But after almost a year there are no signs of any stress points in the seat fabric. Maybe it was my superb needlework across the entire perimeter! Honestly though, I think car seat material is normally pretty rugged stuff. Getting the needle through it was not easy. I actually took the seat cover off the seat to facilitate the threading. Stretchsit cushion works great as is, it's just in my "hacking" nature to try to improve everything. It doesn't always work out perfectly, but this one did - my Stretchsit cushion is secured exactly where I need it! Wow - I'm impressed. Good solution if you and people roughly your size are the only ones driving the car! "Over the past year I have been acutely suffering from Thoracic Outlet Syndrome which has meant the nerves and blood supply to my arms and hands have been compressed somewhere in the thoracic region resulting in pain, weakness, numbness and pins and needles in my arms and hands. I am not aware of the route cause of my condition, but posture is seen as a key/likely contributor. Both my psychotherapist and osteopath have worked on improving my posture, and specifically, trying to correct a forward head/forward shoulders posture which has come about through many hours/years spent working at a desk (and thus, in theory, resulting in the misalignment of nerves and blood supply to my arms and hands). Unfortunately, I find that most chairs and seats inadvertently exacerbate my symptoms. The worst for this are car seats that have fixed headrests that push your head forwards as well as your shoulders (presumably to reduce whiplash injuries), and subsequently make your mid/upper back sink backwards. 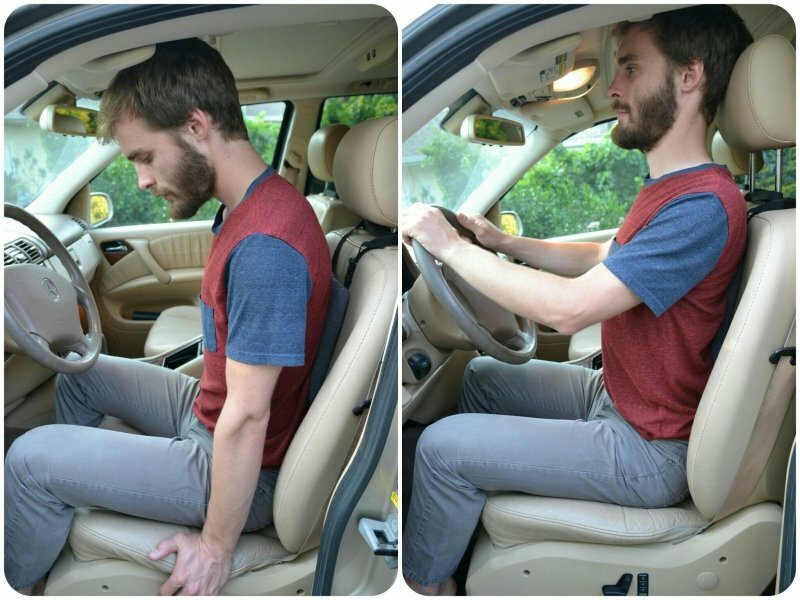 The Gokhale Method Cushion has allowed me to effectively counteract this effect - by hanging the attachment band around the headrest and placing the cushion at the mid back level, it has allowed my shoulders and head to be in a more neutral/natural position. The cushion has transformed driving from being an agonising experience to something that I can do in comfort again. The same is true of my office chair for which I bought a second Gokhale Method cushion. I can’t recommend the cushion highly enough”.